Proper putting fundamentals start with the stance. You want a stance that's wide enough for stability, but narrow enough to be comfortable. We recommend a stance that's about two inches wider than your neutral joint alignment. What does that mean? Neutral joint alignment is your body's anatomically correct position. Your body is designed to stand naturally in this position. Your hip sockets are located right around the first belt loop on your pants, or slightly lower. When you are in neutral joint alignment, each joint is stacked directly on top of the one below, meaning that your knees and ankles are directly under your hip sockets. Hang a club down to see what this looks like, as in the first photo in the series below. When we say two inches outside of neutral, we mean that you should widen your stance by moving each foot two inches beyond the neutral point. The second photo below shows what that looks like. Two inches outside of neutral gives you enough stability to stand nice and firm over the putt, but it's also narrow enough that you feel comfortable. If you get too narrow, with your feet just a few inches apart, it may be difficult to stay balanced if the wind starts to blow or you're on a hill. If you get too wide, it's just not going to feel natural or comfortable. The next aspect of setting up a putt is ball position. The ball actually sets down in the grass a little bit. The weight of it presses the grass down and it nestles in. You want the natural loft of the putter to lift the ball up just enough that it can roll on top of the grass. Most putters have about 4-5° of loft that we can use to get the ball up on top of the grass and rolling right away. Just like any other golf swing, the putting stroke follows an arc. As the putter swings back and through, it obviously has a low point. The low point of the arc is where the putter has the correct amount of loft. Like any club, it delofts on the way back, and gains loft as it swings forward. You want to make contact with the ball at the bottom of that swing arc. In order to do that you need to put the back of the ball in the middle of your stance. Draw an imaginary line through the middle of your stance and position the back of the ball on that line. If it's too far back, you'll end up hitting down on the ball. You'll come in with a descending blow that will smash the ball down into the grass, and then it will hop up and bounce. If it's too far forward, you'll catch it on an ascending blow. That will loft the ball into the air and, again, it will start to bounce. When you place the ball in the center of your stance you can contact it at the very bottom of the swing arc and use the natural loft of the putter. The ball will get a great roll right away. Weight distribution for putting is very simple. We recommend that you just keep your weight centered 50/50 between your feet and maintain that throughout the entire stroke. That way the bottom of the swing arc is in the middle of the stance. If you tend to lean to one direction or the other, that will change your swing arc. Take your normal address position and balance your weight evenly. When you swing the putter you'll find that the arc of your swing grounds out right in the middle. As you start to shift to the right, the bottom of the stroke moves a little farther back. If you shift left, the reverse is true. Just keep a nice 50/50 weight distribution between your feet throughout the putting stroke. Keep that even balance as you swing back and through for ultimate consistency. 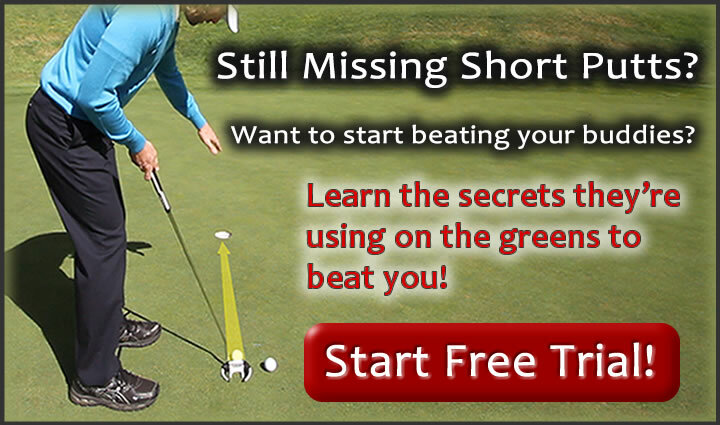 Get Your Free Membership to Watch "Putting Stance & Setup | Proper Tips & Instruction" Right Now!